Some members of the herb family are known to become quite invasive when planted in and among other herbs in the garden. If left to their own devices, these herbs quickly will choke out their more docile garden companions and take over. Many of the invasive herbs are quite attractive and useful in the home garden, and as long as they are watched carefully, can coexist peacefully with their neighboring plants. Invasive herbs can be kept in check very easily by keeping them in individual containers, or compartments, in the garden. By keeping your invasive herbs separate, you not only keep them from choking out or taking over your other herbs and plants, but you’ll be assured that each of your herbs keeps their individual and distinctive scent and flavor. When different types of mint are allowed to mingle and roam freely among one other, you can wind up with them all tasting very much alike. Even if you have a large yard or garden that allows you the space to plant invasive herbs directly into the garden, it is recommended that you plant different types of herbs at separate ends of your garden. Otherwise, your peppermints and spearmints will all become double-mint. Container gardening for invasive herbs can be done one of two ways. You can plant individual herbs into individual containers and leave them above ground, or you can recess the containers into the ground. If you decide to recess your containers, it’s best to use simple undecorated containers made of plastic, such as the ones you purchase plants and seedlings in. Don’t recess the invasive herbs in the same container that you purchased them in though. Use a container that is a size or two larger to ensure that your plants have room to grow and mature. To recess a container for invasive herbs, dig a hole large enough for the entire pot to fit into, leaving the lip (top portion) of the container sticking out approximately 1 or 2 inches. Be sure that your container has drainage holes. Fill the bottom of the container with gravel or Styrofoam pellets to allow proper drainage of the pot. Add potting soil and then plant your herb into the buried container. Your container-gardened herbs will need to be dug up every year or two and divided to keep them from becoming root bound. Compartment gardening can be done by placing borders around your invasive herbs that are planted directly into the garden. You can create separate compartments for your invasive herbs using metal or plastic edging around them. The edging must be buried fairly deeply, to keep your herbs from spreading. Some herbs become invasive because they re-seed themselves very quickly and easily. Comfrey and lemon balm fall into this category. Check around these plants frequently to see if there are any unwanted baby seedlings growing around or beneath them. Some herbs become invasive because they propagate themselves by way of rhizomes. A rhizome is a horizontal plant stem with shoots that grow above ground and roots growing below. These are also called rootstocks or creeping rootstalk. These runners are how the plant reproduces itself. 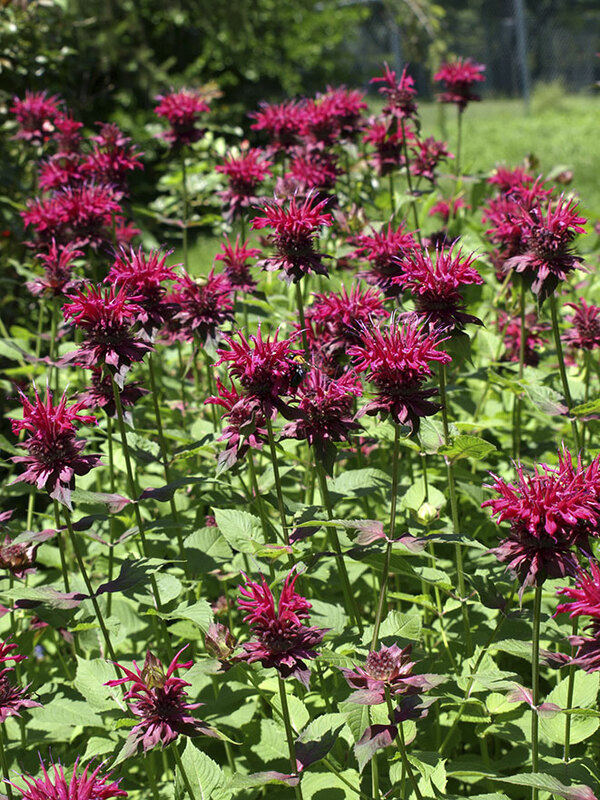 All members of the mint family and bee balm reproduce this way. Always check around these plants in search of runners, which need to be removed quickly before they set roots. With a little extra care, you will find that invasive herbs can be a welcome addition to your herb garden.